A healthy lifestyle and an efficiently working body have direct effects on workplace productivity and office morale. Activity is fun, but maintaining an active lifestyle is also among the most essential elements of daily life. 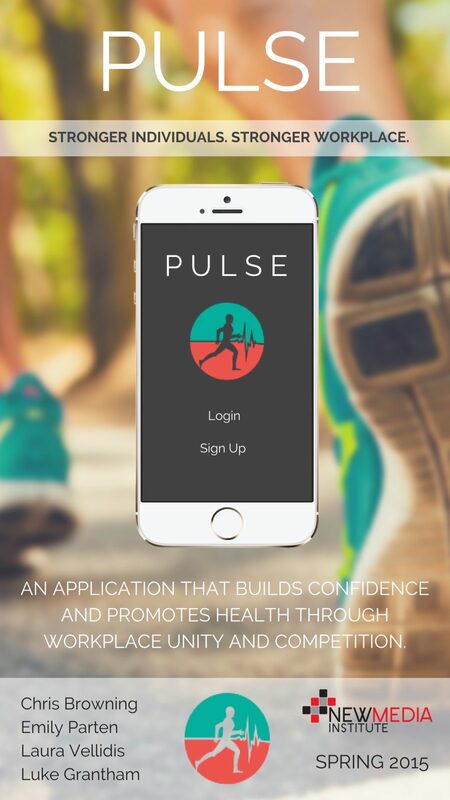 We are solving this pandemic by designing a simple, hand-held fitness tracking web application, which we call Pulse. The easy to use Pulse web application allows a workplace to be divided into teams based on department, which then compete in quarterly fitness competitions. Individual users have the ability to log minutes of specific activities, compile quarterly totals, link to co-workers with similar fitness goals, and encourage the regular activity of teammates. By establishing teams consisting of employees working in close contact with one another, we encourage not only the celebration of individuals, but also departmental cooperation. We care because people are far more concerned with finishing a Netflix marathon than finishing an actual marathon. We care because a habit of work all day and sleep all night is far more common than a habit of active living. We care because our generation is on the cusp of the working world and we want to know it will be an environment that can sustain itself. Our focus is on stronger employees building a stronger workforce. Our goal is to keep a finger on the Pulse.